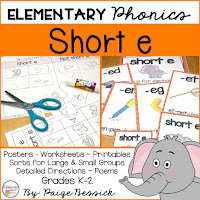 This blog post will go through specifically how I teach my students the short a phonics skill, but this is exactly how I teach EVERY OTHER phonics skill too. I believe it is so important to teach phonics skills following common routines. 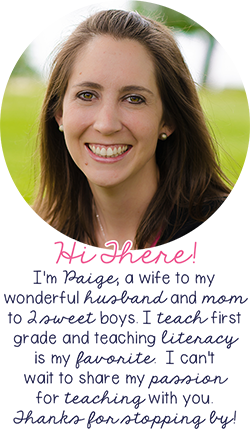 That way students can focus on learning the skill and not learning the activity or routine to go along with the specific phonics skill. 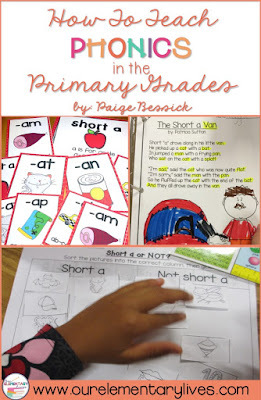 To teach short a, I use my Short a Word Work Activities: Sorts, Worksheets & Poems. I created this product as a way to teach this skill to the whole group, small group, and individuals. 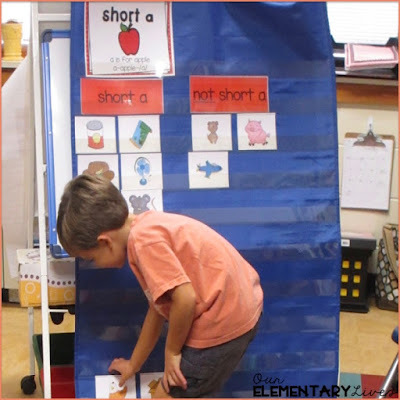 The whole group activities allow me to teach the skill to the whole class, the small group or center activities allow my students to practice the skill with support from each other and the independent activities provide more practice or can be used as a quick assessment. This is this product I use in my first grade classroom. Please don’t judge the photo quality of the pictures below. I want you to see it in use so my focus is not on the quality of the photo but on the use of the product-plus I'm no professional photographer-although sometimes I wish I were. 😜 I think this product would be appropriate for kindergarten through second grades or as supplemental instruction for older students or students with special needs. Let's get started! 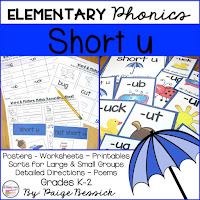 Here's how I teach ANY phonics skill. 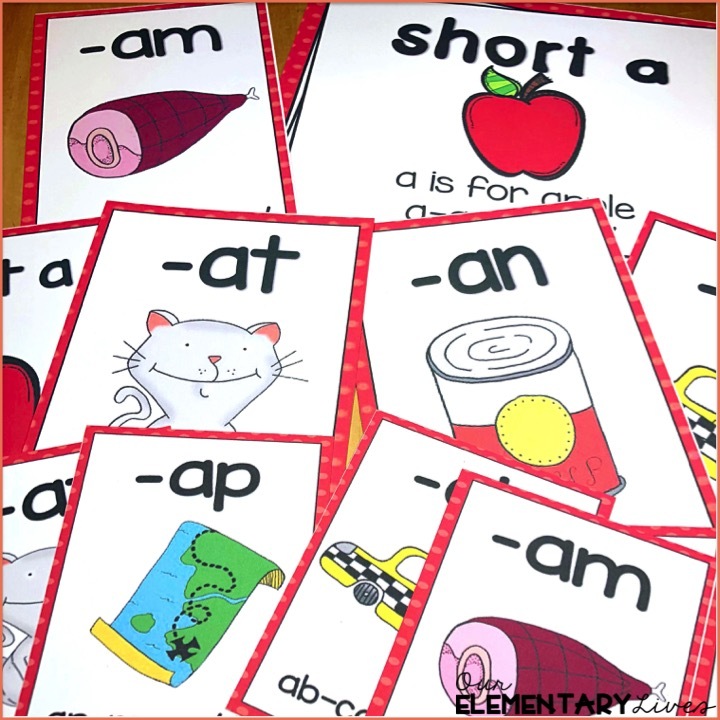 Let's start with all of the components I use to teach a phonics skill. Let's think ALLLLLL the way back to your undergrad teaching classes...remember the term scaffold? Well, let me tell you, it is alive and well. I know it, use it and love it. Let me explain. 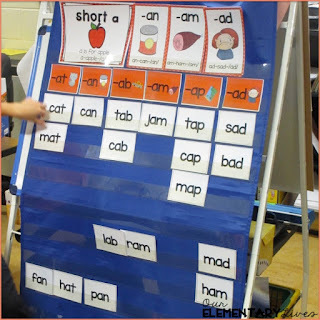 I start any phonics or word work skill with a large group activity-typically posters and a sort-the I do part. 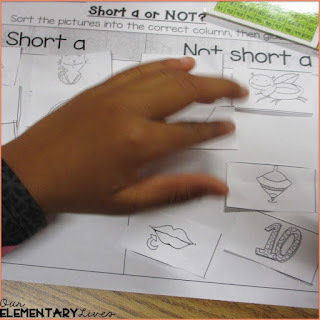 I explain and teach the sound or skill we are learning using visual posters. I love having these up around the room and my own copy, right by my teacher's chair. Whenever we get a chance we practice the sounds. I hold up a card and they have to say the sound that goes with it. For the a the students say, a-apple-/a/. That's letter name, the picture and then the sound. For the word family, endings they say, -am-ham-/am/. Again, letters, picture, and sound it makes. 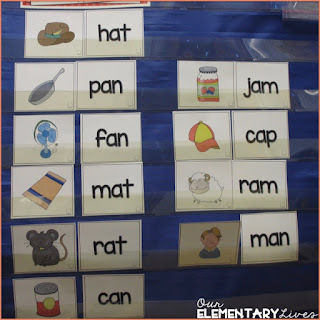 We go through them every time we do phonics while we're learning this sound. Throughout the year I'll conitnue reviewing them and pull them out when I feel like my students need a refresher. I then go on to demonstrate the sort we will be doing. 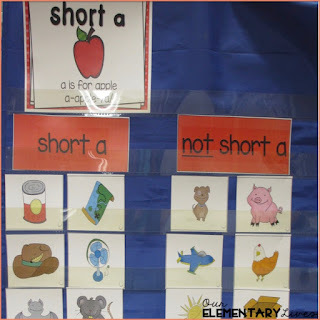 I do the first couple words or pictures and put them under the correct heading-explicitly teaching the skill. 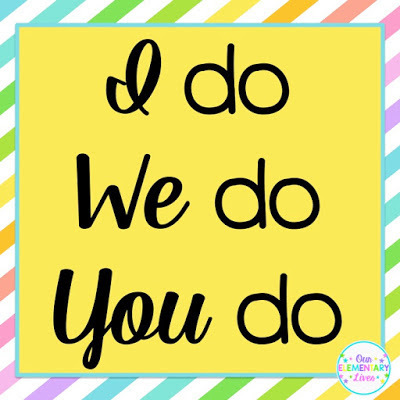 After I have done several and I feel that my students understand what I am teaching, I have the kids come up and help me finish the large group sort-the we do! As we complete the sort, I have the students tell me the picture or word and where it goes and why it goes there, making sure they can explain their thinking. Here students have to read the word and match the picture. Here is where I teach common word families for each of the vowels. 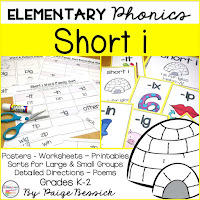 After the large group sort, sometimes on the same day or a different day (depends on our time-we usually only have 15-20 minutes for word work), I will break students into small groups or partners to practice the skill we just did together. This is still the we do. They are doing it in their group or with their partner, working together to complete the task correctly. I will also sometimes do this as a center activity so they can practice this task in a small group several times. It never hurts to practice these skills more than once. Once I feel that the students have a good understanding of the skill I will have them do an independent activity to assess-the you do. This is sometimes a cut, sort and glue or sometimes a worksheet. 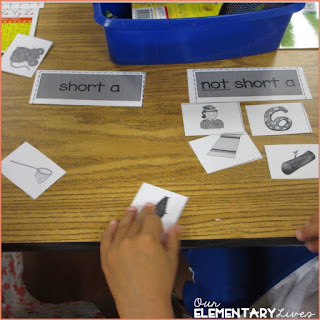 In this product, there is a cut, sort and glue for each sort and some no-prep, print and go worksheets as well. I like using this one as morning work. And I love their drawings. 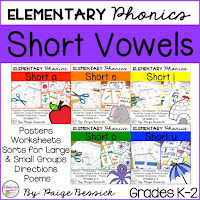 Another activity that is included in each of the vowel resources are fabulous poems written by my mother-in-law, author Patricia Sutton. There are 3 poems to choose from. 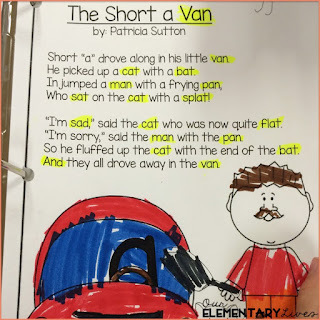 My students LOVE using high lighters and we use these poems as shared reading warm-ups throughout the time we are learning this skill. I also like making anchor charts as a class. This will then go up in our classroom as a tool for the students to use when they are reading and writing. Each word family card is also included in the product. To create the anchor charts I have them just remember some of the words we worked on this week. I have also had them use the iPads and the app EPIC! to find words with the phonics skill we're learning. 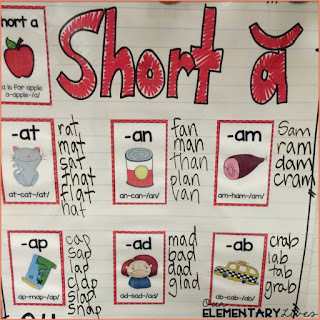 Check out this blog post, Easy Word Work Activities, to see how I involve the students even more in creating anchor charts for phonics skills. That's it, easy peasy, right? Haha, if only it were that simple. You know some students will get it right away and some won't until you've retaught and practiced the skill for 3 weeks. You will have to reteach some and try to challenge others. That's just how our classrooms work and that's what makes teaching so fun. There is never a dull moment. 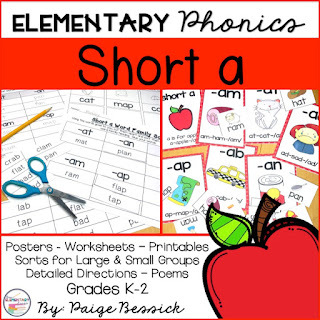 If you like this short a resource, then I think you'll also like my other short and long vowel resources. 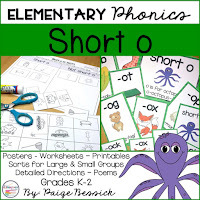 Click >>HERE<< to see all of my phonics resources or click on any of the images below to see specific resources. 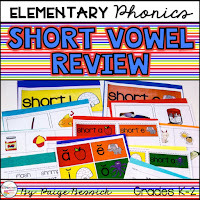 I also have all of the long vowels, bossy r, inflectional endings, contractions, magic e.
Click on any of these images. 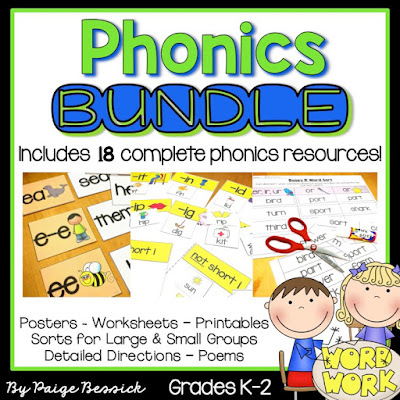 Check out the Phonics Bundle >>HERE<< or by clicking the image below. 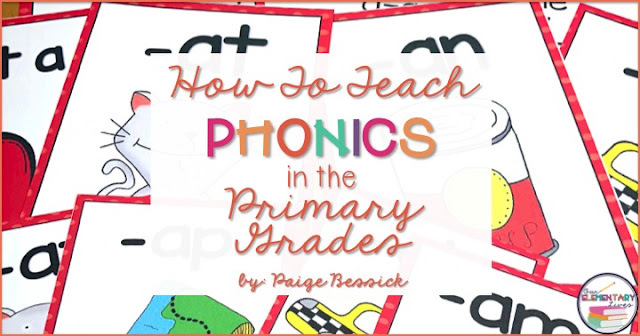 There are so many ways to teach phonics. There are so many programs and other TpT sellers who also have great products! This is how I do it and this is what works for me and my students. 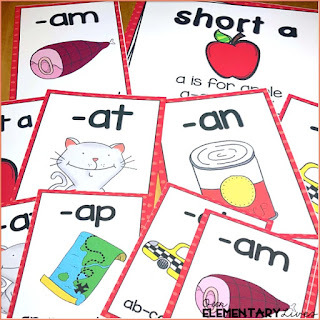 Continue posters and verbal practice of sounds with visuals. Use pictures and words that relate to our content (science/social studies) focus and unit. 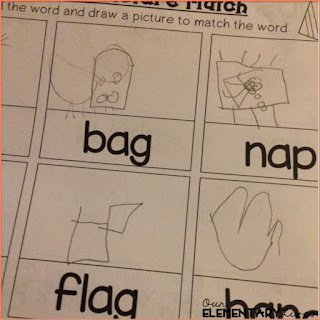 Use pictures and words my students know as ELL learners. Complete metalinguistic analysis and discuss how this is similar/different to Spanish. I wanted to make sure I mentioned that. If you have questions about how this looks in my dual language class, please comment or email me at ourelementarylives@gmail.com. Please share and pin so other can see. Interested in trying out some of the activities? Click >>HERE<< or on the image below to get a FREE sample. Make learning interactive, engaging and fun!